I’m not sure how this amazing story has passed my notice, but I’m glad I’ve finally stumbled upon it. Juliana Buhring is clearly an extraordinary person. Wikipedia describes her as a British-German ultra-endurance cyclist and writer. Having read a little background about her I think she could only be described as an internationalist. I didn’t interview her for this blog post, instead I’ve compiled this from a few articles I found about Juliana from the past few years. It all began in December 2012, when she set the first Guinness World Record as the Fastest Woman to Circumnavigate the Globe by Bike, riding over 29,000 kilometres in a total time of 152 days (144 actual days in the saddle). In order to qualify for the title, Guinness World Records requires the rider to cover 28,970km – the world’s circumference – by bike, passing through two antipodal points. The ride must commence and end in the same location and must not deviate more than five degrees off course. The same bicycle must be used throughout and the clock does not stop on any occasion. For her ride around the globe in 2012 she started her journey in Naples, cycled through France and Spain to Portugal, and caught a flight to Boston, Massachusetts. Buhring cycled across the US, before continuing her journey through New Zealand and the Australian desert. From here, she flew to Singapore, where she continued north through South East Asia and afterwards, India. Flying into Turkey, Buhring cycled along the coastline, making her way back to Italy and completing her journey on December 22, 2012. Prior to her decision to circumnavigate the world, Buhring barely cycled. Despite discouragement from those around her, she trained for eight months on an ordinary bike, immersing herself in the world of fitness and endurance. She was not a professional athlete, but she was determined. Wanting to test – and prove – that ordinary people are capable of great things, Buhring set out without sponsorship, financial backing, or technical and medical support, on a basic road bike. “I’m a very normal person. I don’t think [what I’ve done] is amazing. I think everyone has the ability to do a lot of things and they just don’t; most people never find out what they’re capable of. It’s fear of failure of fear of consequences,” said Buhring. Her endeavour was financed only by the online donations of friends and supporters. Despite almost running out of money along the way, as well as being chased by a pack of dogs, attacked by magpies and encircled by an Indian mob, Buhring was determined to complete her goal. From a broken gear shifter, 29 flat tyres, six broken spokes, four serious falls, and a broken pedal, to a smashed iPhone and nearly freezing to death in a New Zealand mountain pass, Buhring came to know the meaning of ‘endurance’. Yet some of the endurance was more mental than physical. 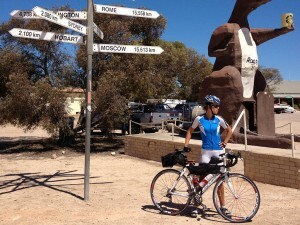 Talking about her cycle through the Australian desert, Buhring said: “It was the most mind-numbing part of the cycle. It’s the world’s longest straight road and there are no trees. “I didn’t know there was a border you pass through right in the middle of the Nullarbor. So I had brought this pack of fresh oranges to take with me through,” Buhring added. In 2013, Buhring was the only woman to participate in the inaugural Transcontinental Race from London to Istanbul, finishing in 9th place overall. In 2014, she won the first edition of the Trans Am Bike Race (women) and 4th place overall, riding 7,137 kilometres in 20 days and 23 hours. She achieved all this after she started cycling for the first time in 2011 at the age of 30. Juliana Buhring is also co-author of Not Without My Sister, an international best-seller translated into 11 languages, detailing her life growing up within the Children of God and will soon publish another book about her cycling feats titled This Road I Ride. I’m really looking forward to reading her forthcoming book. Even though it’s about her cycling journeys I expect it will be more about endurance of an amazing woman. Well done Juliana.